Decades-Old Mystery Put To Rest: Why Are There X's In The Desert? Pez Owen was joyriding in a Cessna airplane when she spotted one down below. A landmark that big would show up on any flight chart — but it wasn't logged. Then she spotted more X's in the distance. 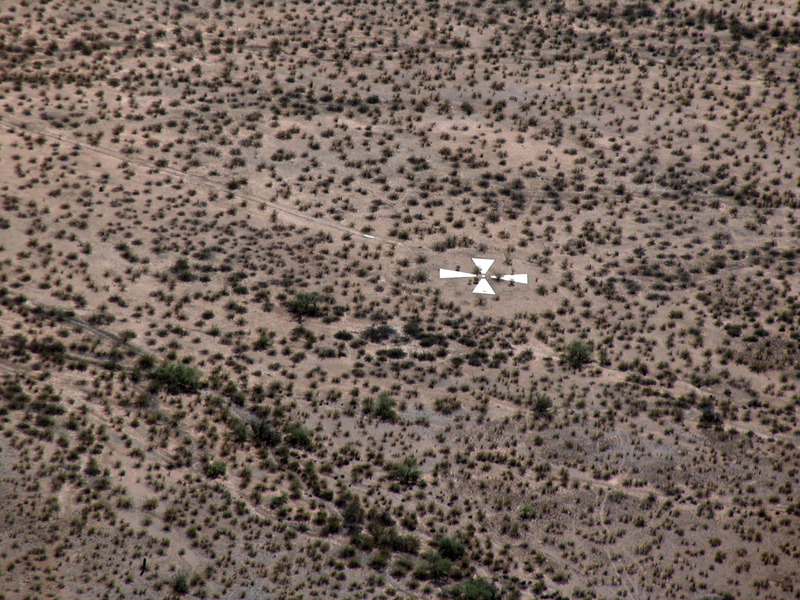 Decades-Old Mystery Put To Rest: Why Are There X's In The Desert? Pez Owen was joyriding in her Cessna airplane when she first spotted a giant X etched in the desert. "It's not on the [flight] chart. There just wasn't any indication of this huge cross," she says. Pez Owen was flying over the desert in her single-engine Cessna airplane when she spotted a huge "X" etched in the desert below. She says it was the strangest thing. "It's not on the [flight] chart," Owen says. "There just wasn't any indication of this huge cross." Then she spotted another one. "There had to be some reason," she says. "So, of course, I immediately thought I had to get Chuck in on this." Chuck Penson is her former colleague from the University of Arizona. Penson worked in facilities, and Owen worked in the planetarium. Now, they're adventure-seeking friends. That's how Scott Craven from The Arizona Republic described them in a recent article. Their version of hanging out is exploring abandoned mineral mines and military radar bases. Mysterious X's plotted in the desert was too good to pass up. "I was not going to rest until I knew what was going on with these," Penson says. "It's conspiracy theory stuff, you know?" Owen says. "It's right out of the movies." Owen rolls out a map she received from the Defense Mapping Agency. It shows Casa Grande, Ariz. — the same area she flew over. Owen points to rows of little boxes that are drawn in. "You can see each of these [boxes] is one of the crosses," she says. "There's a grid of these things," Penson says. "There's not just a few, there's a bunch of these." He counts 273 X's on this map. Each marker is spaced about a mile apart. Pez Owen had flown her little plane over the edge of a massive 289-square-mile grid. 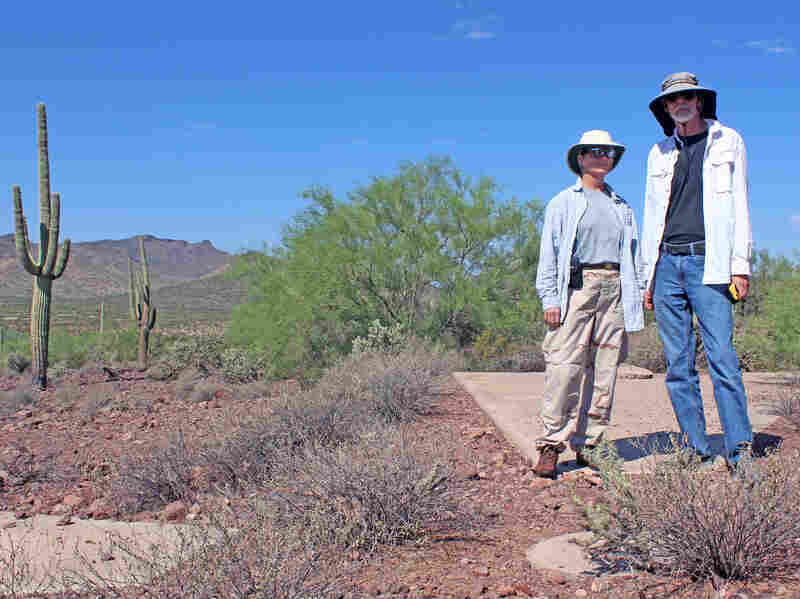 Owen (left) and Penson stand on marker "Y57," located at the southwestern edge of a massive 289-square-mile grid of concrete X's. These two are about to see one up close. They plot out a point and set off to search for an X. We're way south of Phoenix when Penson's GPS navigates the car right off the highway. We're not driving on any road. We're heading somewhere deep in the desert. We step out in the searing heat and into a desolate landscape — just cactus and tumbleweed. "Middle of nowhere," Penson says. We walk toward the base of a small mountain range, and that's when we see it: four 25-foot slabs of concrete inlaid in the desert floor that form a giant "X." Penson kneels down to brush off the sand covering a tarnished brass plate at the very center. The engraving reads: "$250 fine or imprisonment for disturbing this marker — Corps of Engineers - U.S. Army." That's who Penson and Owen contacted to get their answer. These X's were once part of a top-secret government program called CORONA — the nation's first reconnaissance satellite program. 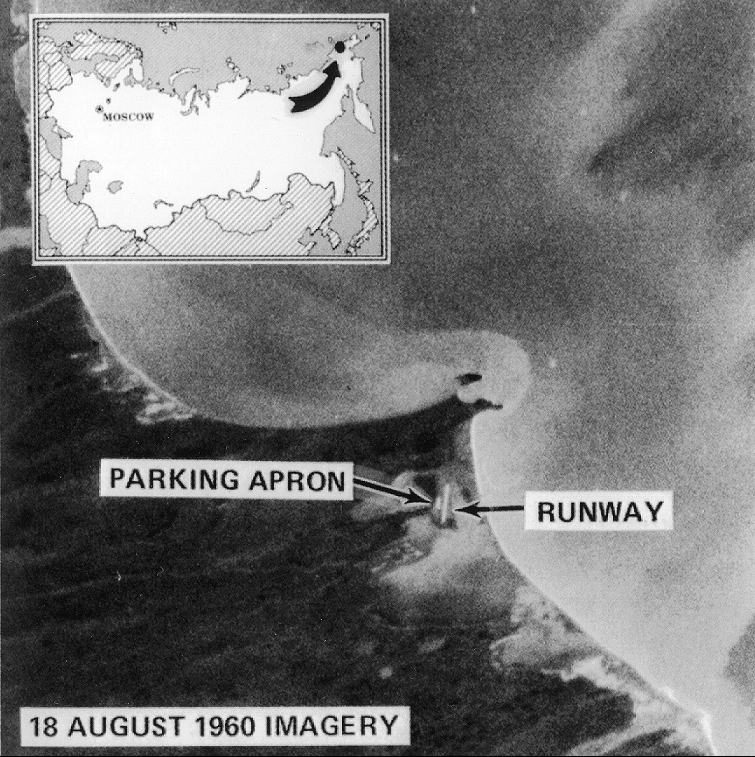 Some of the first images taken by CORONA captured Mys Shmidta airfield in Chukotka, Russia — an Arctic staging base for Soviet bomber flights. 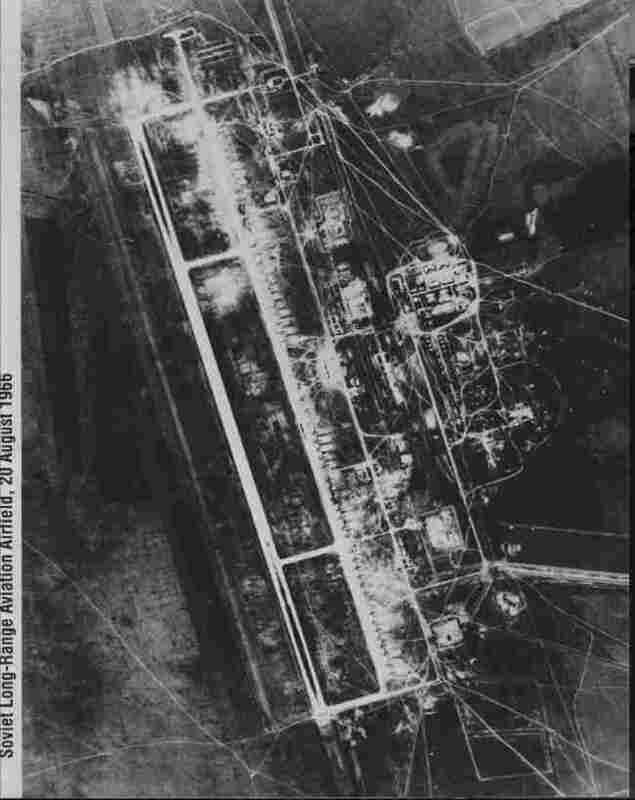 This CORONA spy photo from Aug. 20, 1966, shows Dolon airfield in Semipalatinsk, Kazakhstan — a major Soviet bomber base. The CORONA project is outlined in a declassified 1972 CIA film strip titled A Point in Time: The Corona Story. It's filled with footage of men in lab coats in secret laboratories doing top-secret things. This is Cold War-era stuff. "All phases of the operation were performed under strict security," says the narrator in the film. The CORONA satellites orbited 100 miles above Earth with the objective of taking spy photographs of the Soviet Union and China. Spy photos were flooding in — but the pictures were blurry. That's what the concrete X's were for. That grid out in the Arizona desert was used to calibrate the cameras on board the satellites. Suddenly, the images were coming back crystal clear. "[We saw] all their SAM sites, all their airfields, all their nuclear weapons testing and storage sites," says Arthur Lundahl in the film. He was the director at the National Photographic Interpretation Center. Over a span of 12 years, the CORONA satellites captured more than 800,000 images. That's 2.1 million feet of film. "I just thought, 'How cool is this?' " Penson says. "You know, one little tiny piece of a tremendous Cold War effort to keep safe the United States." "This [X] we're standing on right now helped protect us from nuclear war," Owen says. The CORONA project carried a strange kind of deja vu for Pez Owen. It stirred a childhood memory. "The name sounded familiar," Owen says. "And I think I had to check with my brother to make sure." That's when she made the connection. Her dad, Sid Owen, was part of the same top-secret program. Pez Owen and Chuck Penson inspect a concrete X in Casa Grande, Ariz. This marker is located just outside a rural neighborhood. "So he was actually working on the payloads for these satellites, and what the payloads were — were cameras," Owen says. They were the same cameras that focused on the X's. "He died a few years ago," she says. "And he was so good at not talking about it." He never told her much of anything — other than the name. "I'm getting to know him better," she says. Hang around Pez Owen and Chuck Penson for any amount of time, and they're bound to tell you that you never know what you'll come across in the desert. "It's all around," Owen says. "Just keep your eyes open and ask questions and you'll find amazing things."